1. Preheat oven to 350ºF. Line two miniature 12-muffin pans with fluted cups. 2. In a bowl, whisk flour, baking powder, baking soda and salt and set aside. In a separate large bowl, beat together butter and sugar until creamy and the mixture forms ripples, about 2 minutes. Add the egg and vanilla and beat until combined. Add the lime zest and rum and beat until combined. Then, with mixer on low speed add in alternate batches the flour mixture and apple sauce, beginning and ending with the flour. Mix until just combined. 3. Divide the batter between the muffin cups. Bake until a rich golden brown, 25-30 minutes, until a toothpick inserted into the middle of a cupcake comes out clean. Remove from oven, let cool in the pan slightly then place the cupcakes onto a wire rack to cool completely before frosting. 1. Beat butter in a bowl with an electric mixer until creamy, about 1 minute. In batches, gradually add confectioner’s sugar, and beat until well blended and the consistency is smooth and somewhat stiff, about 3 minutes. Add lime juice and beat well to combine. In a food processor, combine lime zest and mint leaves and pulse a few times until the mint leaves are very finely chopped. Add to the frosting and beat until combined. 2. 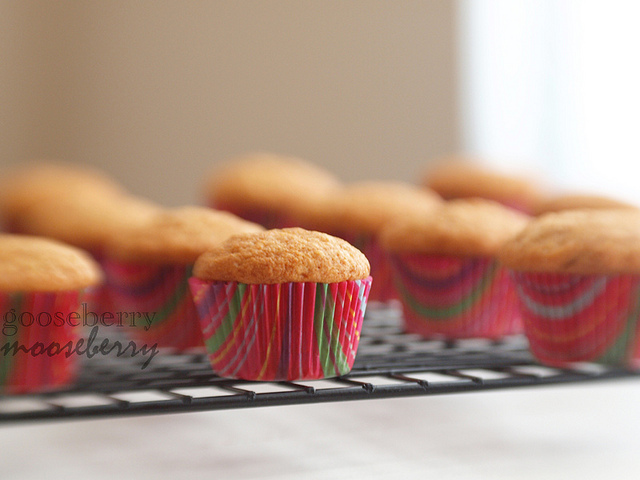 Spread or pipe onto cooled cupcakes (rounded and petal tips were used in the photos). If not using immediately, cover the frosting with a damp paper towel and plastic wrap, and refrigerate until needed.